The following emails were intercepted by our crack team of investigative journalists. They are from the internal communication system of a shadowy organization of bird enthusiasts that we haven’t even managed to put a name to as of yet. They are reprinted here in their entirety in the public interest. We have color coded them by sender in order to make comprehension easier. Operation Duck Drop was a success. The bird was released with no living witnesses. Outstanding work, Sparrow! I’ll make sure to put a note in your file. Sparrow has successfully completed Operation Duck Drop. What an excellent operative! Now begins the waiting game. How lazy and/or bad are these New York City birders? 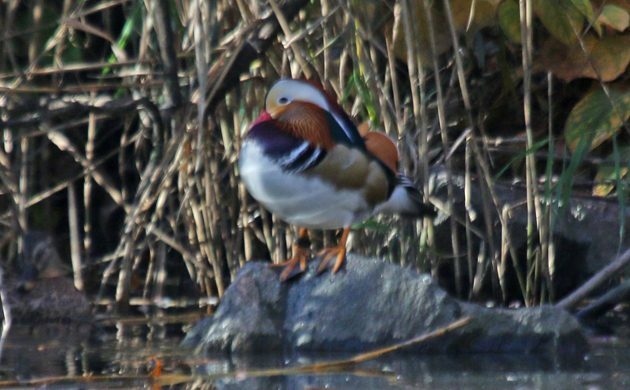 A gorgeous and flamboyant duck in one of the most heavily birded parks and they still haven’t found it? I knew we should have used a bigger species! Have patience. Remember how many drugged Corn Crakes we had to release? They’ll find it. I’ve been monitoring the listservs, Facebook groups, and Twitter alerts. The bird has been found but apparently birders already believe it to be an escape rather than a natural vagrant. This might not have been the best species to use. You left a band on the bird? Of all the incompetent moves! No one’s going to care about a bird that is provably a release/escape! This failure is definitely going in your file! How could we have such an incompetent operative? He left the band on the bird? This is unacceptable and a reflection on your leadership. Sparrow has completed many other operations and there were no objections to using him, including from you. Sometimes people make mistakes. What’s important is that no one know that we were involved with this bird or any of the others. A thousand apologies. I left the knife I was planning on cutting the band off with in the body of the witness. Good news, though! We got some press! Wait, you actually killed someone? I thought that “no living witnesses” was a joke! This is a disaster! We’re never using you again! Relax. I have the body saved for use in Operation Vulture. No one will miss a sad, lonely birder. Despite the band being left on the duck I still think we can consider Operation Duck Drop a success. We got some good press and the duck is wandering around Manhattan now. That said, we should not use Sparrow as an operative again. He’s unreliable and a bit scary. I think with Operation Duck Drop having been a resounding failure it is time to figure out our next operation. It can’t be a skulky bird because the birders will never find it and it can’t be something completely unbelievable because no one will chase it if they think it’s not a natural vagrant. What about a Jabiru at Cape May? Why haven’t you been returning my calls? I’ve done so much for this organization! The wood rail, the ridiculous drive from Texas to Maine with that damned hawk, Ivory Gulls beyond counting! I better hear back soon! Everyone in New York City is losing their mind now. The duck has come back to Central Park and it’s gone viral! Who cares about the band? Everyone loves this bird! Very well. Operation Vulture is a go. Let me know if you need any resources. We’re not sure what all of this means but it is very concerning. Perhaps we should be very careful before accepting any future vagrant vulture records? And if a Jabiru shows up at Cape May that record had better be seriously scrutinized! I have come across this organisation, they call themselves RAIL. This just made it to our local news-slow news day!